This level mostly consists of jumping across platforms. The Koopas you'll encounter here are no danger since they won't run off the platforms they're standing on. In fact, the Blue Koopas can be helpful if you have Yoshi, since you can use them to fly across the level. The ? block here contains a feather. In fact, all of the ? blocks in this level do, so use this to stock up on them. Some of the jumps in this level can be tricky, such as the one right before the blue pipe. You'll need to jump at just the right time to make it over the gap. Speaking of the blue pipe, entering it leads to a bonus area (see below). You will appear at the top left. Use the checkered platform to jump on the wooden platform. It will rotate and you'll get lots of coins and eventually 1-ups. Fall down and use the pipe at the bottom right to exit the bonus area. You'll return at the green pipe further down the level. 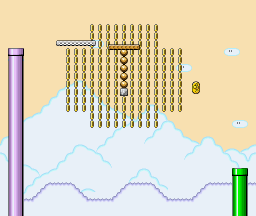 The Fuzzys in this part of the level can be tricky, since they can hurt you if you keep standing on the platform. You'll need to make quick jumps to get through unscathed. Having Yoshi helps as he can just bounce off the Fuzzys unharmed. The green star block at the end gives you a 1-up if you've collected over 30 coins. This is easily done by entering the bonus level, which contains more than enough coins. Hit the turn block here to reveal a vine. Climb it up all the way and jump off onto the rotating platform to reach the exit. If you have Yoshi with you, swallow the Blue Koopa instead to gain wings and just fly up to the exit. Be sure to not touch the goal tape from the bottom, or Mario will fall down to his doom in the level ending sequence! If you've beaten this level the normal way, you'll notice it just unlocks a loop that leads to itself, which isn't very helpful. To continue onward on the quest, you'll need to find the secret exit. It's situated on a platform way behind the normal exit. To get there, you can either fly across as Cape Mario, or, if you have Yoshi, swallow the Blue Koopa and fly across the gap. Be sure to grab the three 1-ups from the turn blocks before you hit the goal tape. At the beginning, on a platform high up reachable by a rotating platform. Just before the blue pipe, keep standing on the rotating platform and you'll run into it. Between two rotating platforms in the area with all the Fuzzies. On the second-to-last rotating platform before the end of the level. Be careful to not be hit by the Fuzzy! This page was last edited on 18 December 2014, at 01:25.